Let’s face it: maintaining your own warehouse facility is hard, not to mention expensive. For half of the year, you’re looking at a partially empty building and the other half, you’re piling product in the aisles. Product gets lost; product gets damaged; people get frustrated; customers are unhappy. That’s why allowing us to do your warehousing is the perfect solution. You pay for the space you need—only when you need it. Your fixed expense becomes a variable expense. We provide the space, the manpower (and womanpower! ), and the expertise to allow you to flex your supply chain muscle without having it becoming a logistical nightmare. We service customers from just about anywhere; including local clients from Greensboro, North Carolina, and the Southeast to the greater US and Canada. We have more than 67 years of warehousing experience, so whatever you want stored, we have the knowledge and experience to keep it safe and to ship it on time and in perfect condition—making you look like a hero to your customer. At Lewis, we invest heavily in training and technology so that our services always meet the evolving logistics, storage and distribution needs of our clients. We invite you to take a digital 'tour' of our facilities to see the full scope of what we offer. 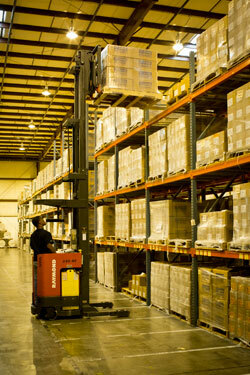 "Lewis has been one of our top performing warehouses for the past several years. They have consistently met and/or exceeded our performance standards, and we are pleased to have them as a partner."